Veterans Day is celebrated on November 11th. 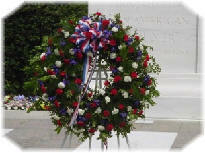 Originally called Armistice Day, this holiday was established to honor Americans who had served in World War I. It falls on November 11, the day when that war ended in 1918. Congress proclaimed the day a federal holiday in 1938. In 1954, Congress changed the holiday’s name to Veterans Day, in recognition of those who served during the Second World War and the Korean conflict. Today, Veterans Day recognizes all members of the armed forces, living and dead, who served during times of peace or war. It is a celebration to honor America's veterans for their patriotism, love of country, and willingness to serve and sacrifice for the common good. Veterans' organizations hold parades, and the president customarily places a wreath on the Tomb of the Unknowns at Arlington National Cemetery, across the Potomac River from Washington, D.C. Many people confuse Memorial Day and Veterans Day. Memorial Day is a day for remembering and honoring military personnel who died in the service of their country, particularly those who died in battle or as a result of wounds sustained in battle. While those who died are also remembered on Veterans Day, Veterans Day is the day set aside to thank and honor ALL those who served honorably in the military - in wartime or peacetime. In fact, Veterans Day is largely intended to thank LIVING veterans for their service, to acknowledge that their contributions to our national security are appreciated, and to underscore the fact that all those who served - not only those who died - have sacrificed and done their duty. Medals of America - Sells Flag Display Cases, Military Insignia, Medals, Badges, and Ribbons to veterans. Medals of America sells Display Cases, Medals, Badges, and Ribbons to veterans.